On Ken Vandermark's Facebook page, squeezed between a request to play what looks to be an agriculture simulation with tanks and 54 birthday wishes to a guy I may or may not have met in 1992, something new and exciting was a brewing. 'Audio One', a new large group, fronted (and a new 9 track book composed) by Vandermark, are planning an April release. 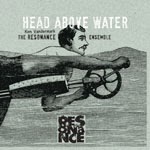 I guess it was time to catch up on his other large ensemble and revisit 'Head Above Water/ Feet Out of the Fire', the late 2013 release from his international Resonance Ensemble on Not Two Records. The album begins by tipping the hat to 70's powerhouse improv group 'Creative Construction Company' and in particular Muhal Richard Abrams with Creative Reconstruction Company. It starts out sounding like a pack of rabid dogs on leashes of varying sizes. You never know if they will pull taught at arms length or mere inches from your jugular. This is the power of the Vandermark composition at its finest. He is there, guiding them though the workout of notes on the page, with whistle in mouth just in case. It builds and recedes and lets the smaller dogs sing before the next wave of growling envelops your ears layered over a pretty addictive drum and bass groove. There is something to be said for the sequence of tracks on a recording. Only seconds after the opening kick to the embouchure, comes Elegy for Two Rooms (For Fred Anderson and Von Freeman). It is like watching a tear from in the corner of someone's eye and over the course of 10 minutes, you study intently as it rolls down the face leaving a trail of itself, and distant pleasant memories, until it slows down over the cheek bone and pauses on the chin before slightly darkening the fabric of the shirt it gets absorbed into. Listen. Without going into too much detail, the second disc is full of Vandermarkisms with include sheets of brass coming at you like ninjas in a cymbal factory to breakdowns where quartets, trios, duos, and solos are highlighted and even revered. However there is a sense of finality to this recording as if all that can be said has been said. I do hope I'm wrong. What is also interesting is the fact that the tributes of the first CDs seem to refer to Vandermark's musical and local influences (AACM and Chicago) while the second one transcends these influences to cultural influences in general (Thomas Bernhard/literature, Jean-Luc Godard and Michael Haneke/film and Robert Irwin/art). Vandermark has always pointed out that there are a lot of influences to his music. It's great to have you back, Philip. I have to say, I thought Vandermark had run out of composers, artists, writers, musicians and film makers to name drop...sorry, dedicate pieces to. Has he come up with some new names, or is he working his way through the list again? The album is excellent by the way - no need for greatness by association.